Ok so the jury is our and your big question is the Bath were we want to spend the cash and where will all the cash go when doing the remodel? We hope we have some of the answers for you below. 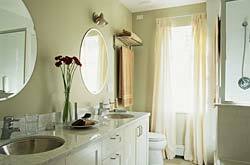 So Per square foot, no room in the house takes more work or costs more money to remodel than the bathroom. The combination of plumbing, moisture content, electrical wiring, and decorating schemes packed into the smallest residential spaces create unique demands on bathroom remodeling. Yet, these same demands also place unmatched value on bathroom spaces, whether in terms of day-to-day living or home property values. Like a kitchen remodel, there will be substantial costs in finished products from flooring, bathtubs, shower surrounds, cabinets, countertops, and numerous bathroom fixtures. These products, however, don’t typically have the same price tags as major kitchen appliances and full cabinet and countertop installations. Plus, bathroom remodeling is a more labor-intensive process between tearing out old bathroom amenities and tedious tile and plumbing installation. In Kalmin’s experience, “60-70 percent of bathroom remodel costs are labor and expenses and about 30-40 percent is finished product.” Of course, this cost breakdown indicates only an estimated average, as the cost breakdown of specific projects can vary quite a bit. No remodeling project shows the cost difference between economical and luxury projects, and no remodeling project holds the potential for greater swings in the breakdown of finished products vs. labor and expenses. You might be able to find a low-end shower door, for example, for as little as $300, while luxury shower doors can run more than $3,000. A bathtub can range from $200 to more than $2,000. Shower surrounds can be just as varied. For a master bath with a separate shower and tub, installation costs can range from $3,500-$12,000. These huge differences in cost are also supported by the Remodeling Magazine Cost vs. Value Report. Other remodeling projects show twice the cost when upgrading from a mid-range to an upscale project. Meanwhile, an equivalent upgrade for bathroom remodels causes the average cost to triple. The average cost of a bathroom remodeling project is approximately $9,000 according to HomeAdvisor, although this includes minor, partial, and small bathroom remodeling costs. A comprehensive bathroom remodel is likely to cost $15,000 or more; a large master bath remodel can easily go over $50,000. Plus, it’s important to know not just the total cost of the estimates you receive from bathroom remodeling contractors but also where that money is going. Understanding this cost breakdown will help you choose the bid with the best overall value and, hopefully, identify contractors who may be giving you unrealistically low, misleading bids. So are you ready to dig in and get started? we look forward to your feedback.